With a new government in place in India, policy-makers from New Delhi and Moscow need to pay greater attention to a wider range of areas that could become a foundation of an even stronger bilateral relationship. When it comes to the India-Russia ties, a great amount of attention is paid to defence, nuclear energy and bilateral and multi-lateral diplomatic engagement, but there are a few other areas if strengthened, can bring about a more multi-faceted relationship. Few areas in bilateral ties are lagging as much below potential as education. While the erstwhile USSR was generous in awarding scholarships to Indian students, both long-term and short-term subsidised and sponsored courses in Russia are now few and far between. Scholarships, especially in scientific and technological domains, will go a long way in bringing together the youth of both countries and set up the technical joint ventures of the future. Indian youth would also be familiar not only with Russian technologies, but with the country’s culture and way of life. India can also increase the scholarships it provides to Russian students both unilaterally and under the ITEC program. Academicians in both countries also need to think out of the box. Russia’s wealth in advanced science and technology has even caught the attention of Singapore’s authorities. The National University of Singapore has an Eastern Europe Research Scientists and Students Exchange Program, where Russian scientists are encouraged to take part. Nanyang, a private university on the island, offers a double masters in computer engineering with the Moscow Institute of Physics and Technology. Although the People’s Friendship University initiated a double degree programme with a private university in Kochi, more tie-ups on these lines are needed between Russian and Indian universities. India’s success story in information technology (IT) and outsourcing has been well-noticed and appreciated in Russia for a long time. In fact, in 2004, Vladimir Putin made it a point to visit the city of Bangalore when he was in the country for the annual summit. The success of techno-parks in India was the inspiration for Russian ventures in places like Akademgorodok in Siberia. With its huge pool of high-tech and engineering talent and a very strong home-grown IT sector and a distinct labour cost advantage over western countries, Russia could be an ideal partner for Indian IT companies looking to bring about new innovations that challenge the Silicon Valley. This is clearly an area that requires the large-scale participation of the private sector, and recent trends, including Yuri Milner’s investment in Flipkart indicate that there is plenty of potential for cooperation between private businesses in IT, ecommerce and start-ups. Those who haven’t been to Russia in the recent past are not aware of the rapid strides the country’s major cities have made when it comes to infrastructure. Events like the APEC summit in Vladivostok in 2012 and the Sochi Olympics also ensured that areas away from the Russia capital received a major infrastructure upgrade. India needs to spend at least $1 trillion in infrastructure to get into on par with developed countries. This presents a number of unique opportunities for Russian companies. Unlike their Chinese counterparts, Russian investors don’t face any suspicion from Indian officials, who have even invited Russia to invest in the Delhi Mumbai Industrial Corridor. India offers boundless potential for Russian companies that may be tied down with the looming threat of sanctions from the West. Russian participation in the modernisation of Indian infrastructure is a win-win for both countries. Right up to the 1980s, the best sports talent from both countries faced off against each other in a wide range of sports. India’s football received its fair share of drubbings from the Soviet side, while the Indian field hockey team taught the Russians a lesson in mastery over hockey stick and ball. There were regular exchanges even in sports like badminton, right until the early-1990s. India vs. Russia in any sport is a rarity considering the fact that cricket is just setting up roots in the latter, but there’s no doubt that the Russian team benefitted from its exposure to the Goa cricket league. Russia offers the perfect platform to train Indian athletes in winter sports and maybe even produce a medal hope in 2018. Upgraded sports facilities in India could open the door for Russian summer sports athletes to train there in the cold season. Such an exposure would do a lot of good for aspiring Indian athletes who would train with some of the best in the world. While Hindi films no longer enjoy the popularity in Russia they did a few decades ago, there is still a large fan base for them, and the popularity of concerts and film-screenings in Moscow are a testament to this. Indian films need to once again be distributed in Russian cinema halls, albeit in a phased and planned manner. Several alternative Indian films have been doing well in the international film festival circuits and these could also be screened in Russia. Those into non-commercial movies in India could also collaborate with Russian film-makers who continue to bring about high-quality cinema. The best way to promote Indian tourism to Russia is to shoot a Hindi blockbuster in the country. 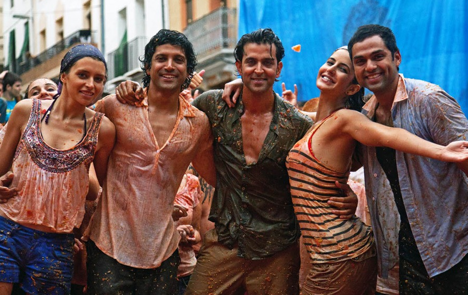 Economically depressed regions of Spain are still reaping the benefits of the Hindi film ‘Zindagi Na Milegi Dobara,’ which showcased the best of the country for Indian audiences. A hit film shot in Russia would create a similar demand to visit the country from a growing Indian middle class that is more than willing to spend on vacations abroad.